"Can you help us not make a bad hire?" This was the opening line from a call from a prospective new client this week that sums up the reasons why many firms turn to a specialist IT recruiter. It's a sentence we hear often, this or variations on the theme. The obvious undertone to this is that the hirer has tried other ways to not make a bad hire, without success. Upon further conversation with these clients, a familiar pattern emerges each time. They've gone out of their way to avoid a bad hire and yet, somehow, managed to recruit someone who wasn't quite the right fit. Time and again. Funny that! Who knew that you could attract something by focusing all your energy on it? Do not notice any white vans. Not a single white Ford Transit or Citroen Berlingo. You are not allowed to be conscious of the presence of a white Mercedes Sprinter, Peugeot Partner or Renault Kangoo. At the end of the day tell me how well you did! 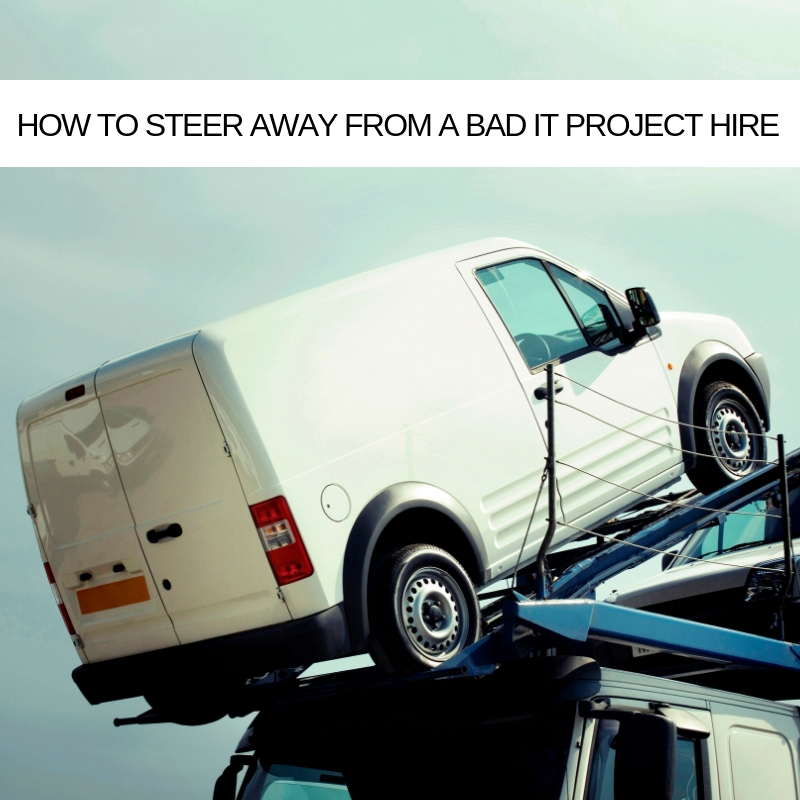 White vans are like bad hires, potentially they are everywhere. Staying with the vehicular theme, an Australian IT Project Management buddy, Johnno recently shared this epiphany he'd had! Johnno has just completed an advanced driving course where he had to drive vehicles around an airfield. These cars could be remotely thrown into a emergency scenario to test the driver. He was driving one over a patch of water when it was turned into a violent skid. The car spun towards a brick wall. Johnno reacted as quickly as he could, he did his best, but it was the instructor taking control that prevented the vehicle smashing into the wall. Afterwards, the instructor said that Johnno had done exactly what everyone does! The moment his vehicle had gone into the skid, he had focused his attention on the wall and the car had followed. "Try it again and this time focus on where you want to end up," he said. Johnno had another go, the remote control forced another skid, only this time Johnno did as he'd been told. He focused on the place where he wanted to steer the car towards. Unlike the last time, there was no need for the instructor to avert a smash because Johnno had manoeuvred to safety! Pretty powerful metaphor!! Focus on where you want to end up! So how do you avoid smashing into a metaphorical brick wall when hiring? How do you steer away? Rather than looking for characteristics that you don't want, focus on the ones that would make your next hire perfect. Amazing how this simple mindset shift can have an impact on who sends you their CV. It's like that wall! Steer towards where you want to be with your next hire. On his advanced driving course, Johnno was sharing the risk with the instructor who could wrestle back control of the vehicle. Some recruiters will offer to share the risk of a new hire with you. You stop paying if the new recruit doesn't work out. Ask your recruitment partner if they'll put their money where their mouth is! I saw a fascinating fact on the TV show QI. About dogs. Run with me. It turns out that dogs can recognise other dogs, not just by smell but by sight too, regardless of breed (and there are almost 400 officially recognised breeds worldwide). When you consider the difference between a Chihuahua and a Great Dane – this is quite something! A dog would pick fellow dogs out of an identity parade. So, what's the point? Great talent works like this. If you can have IT Project Management talent profiled by someone who has done this successfully for a living, you're more than halfway to making a great hire. Again, great recruiters offer subject matter expertise throughout. The paradox of choice! If you have too many choices, you are less likely to choose. In 2000, psychologists from Columbia and Stanford University published a study about jams. One day, at a local food market, customers were presented with a display table with 24 different kinds of jams. Then, another day, at that same food market, customers were given just 6 different types of jam choices. Guess which group bought more jam. Yep, it was the latter. You need a recruitment partner who will reduce candidates down to a manageable number from which you can choose the right hire. Measure your recruiter by how few CVs they present to you, not how many. Less is more! Challenge your recruiter to find the ONE ideal candidate. When measuring potential talent for suitability compare them with the folks who already make up your team and live your culture. The same essential qualities that you'll see in this talent pool are exactly what you're looking for. Ask your crew if they know anybody who might fit any vacancies that you have and ask them to share job ads on their socials. In conclusion, the best way to avoid a bad hire is to stop trying to avoid a bad hire! When you focus your energy on hiring someone who is a perfect match and team up with a recruiter with a track record for introducing just best fit candidates (and who is willing to put their money where their mouth is), it's amazing how quickly you start to only see perfect fit applicants. Just like those bloomin' white vans that you're now seeing everywhere.